The United States Mint has for years been producing gold, silver and platinum American Eagles. Fulfilling a relatively new legal requirement, the United States Mint steps into a new phase of a process that should lead to the production of American Palladium Eagle coins. Named the American Eagle Palladium Bullion Coin Act of 2010 and signed into law by President Barack Obama in December, Public Law 111-303 mandates that a marketing study be completed on the feasibility of an American Palladium Eagle coin program. "An analysis of the market for palladium bullion investments conducted by a reputable, independent third party that demonstrates that there would be adequate demand for palladium bullion coins produced by the United States Mint to ensure that such coins could be minted and issued at no net cost to taxpayers." On April 13, 2011, the United States Mint posted on the FedBizOpps.gov website that it was "seeking sources for a possible competitive solicitation" that would lead to the Palladium Eagle study. Potential contractors had until Friday, June 17, to respond. Once undertaken, the study is not expected to take longer than ninety days. This report will then be submitted to the Secretary of the Treasury and finally to Congress. A further stipulation in the authorizing law dictates that if the study finds potential demand for the coins, their production would begin within one year following the report’s submission. This means that Palladium American Eagles would likely debut next year, assuming the study indicates the program would be self-sustaining. Public Law 111-303 calls for bullion quality American Palladium Eagle coins but also authorizes the production of numismatic grade proof and uncirculated versions. All three would be struck from one ounce of .9995 fine palladium and feature a face value of $25. 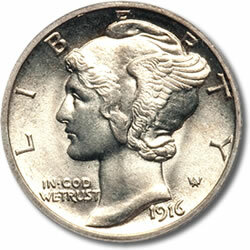 Shown on the obverse of the coins would be Adolph A. Weinman’s "Winged Liberty" design originally found on the circulating 1916-1945 Mercury dime. The reverse would have a version of Weinman’s design showcased on the 1907 American Institute of Architects medal. Other specifications are left to the determination of the Treasury Secretary. If approved, the coins would be struck from palladium mined within the United States or its territories, to the best extent possible. Currently, only the Stillwater Mining Company of Montana produces palladium domestically. Will it inevitably be the case that the bullion coins will be required to be sold as the five ounce silver ATB coins have been sold? The latter program has resulted in most, if not all those selling the bullion coin violating the Mint rules for sale. I’m not quite sure why anyone has insisted on the process including those apparently given to abuse the government program for their own profit. The Mint should issue protocols for sale of the three types of production, with ALL three being available to the public through the Mint, and not the questionable auspices of so called government agents. Is this going to be just like Duke Nukem,,,should I hold my breath ? Why are the sought after coins based on ideology, not someone’s face ! Why are our collectable coins made of valuable metal and not the funny money you would have us believe holds value ? Why did the Feds step in and stop the trade of Liberty coins,,,they were made of real silver and gold. Oh yea ! the federal reserve ( not a part of the federal government ) does not like competition when it comes to the truths we hold as valuable.